The world can be a dangerous place, there’s no doubt about it. Some things, however, aren’t quite as dangerous as you may believe. Despite the hype of sensationalist media outlets, these 20 activities are, from a statistical standpoint, not nearly as treacherous as many believe them to be. 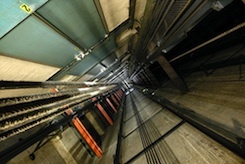 Taking the Elevator – Fear of enclosed spaces and a fundamental distrust of the mechanisms causes many people to forgo the elevator in favor of climbing the stairs, but the U.S. Bureau of Labor Statistics and the Consumer Product Safety Commission estimate that only 27 deaths occur each year in elevators. The majority of those deaths happen to the mechanics working on elevators. Meanwhile, an estimated 1,600 people will die each year as a result of falling down stairs. Swimming in the Ocean – The Jaws franchise certainly instilled a fear of shark attacks in beach bums around the world, but the chances of being a victim of a shark attack is far lower than you may realize. The Ichthyology Department at the Florida Museum of Natural History places estimated annual death toll by shark at one each year. To put that into perspective, cows kill an average of 22 people per year. Scuba Diving – Just as casual beach time isn’t likely to end in a shark attack, heading into deeper waters on a scuba diving outing is a bit safer than you may have been told. Fatality estimates hover around five per 100,000 divers, a third of which can be attributed to cardiac events while underwater. Riding a Motorcycle – In 2001, only 74,000 of the 4.9 million motorcycles, or 1.5% of registered bikes in the United States, were involved in an accident. The National Highway Traffic Safety Administration statistics show that 5% of the passenger cars on the road were involved in accidents that year, showing that the odds of being involved in a motorcycle accident are significantly lower than a car crash. Rollercoasters – Amusement park giants Six Flags commissioned a study regarding the safety of rollercoasters, concluding that visitors to their part have a one in 1.5 billion chance of being fatally injured on a rollercoaster. The study also found that injury rates for golf, folding lawn chairs and kids’ wagons were higher than those of amusement park rides. Flu Shots – Despite the objections of those who prefer a more natural approach, the United States Centers for Disease Control and Prevention insists that flu shots are safe for most people. From 1990 to 1999, the CDC estimates that 36,000 people died from flu-related complications, while the current mortality rate for flu vaccines is 0.2 per 100,000 people. Rock Climbing – The Southeastern Climbing Coalition that approached officials at Signal Mountain in Chattanooga, Tennessee regarding a reversal of a rock climbing ban in the area cited that climbing injuries are so rare that the activity is actually, from a statistical standpoint, less dangerous than hiking. Hiking – Despite what reality television and some news reports would have you believe, your chances of being mauled by a mountain lion or bear or bitten by a snake while hiking are quite low, according to figures quoted by eNature.com. Whitewater Sports – Hurtling down the rapids in a canoe or kayak certainly induces an adrenaline rush and seems like an extremely high-risk activity. In fact, the American Whitewater Association’s safety figures show that a fatality rate of 2.9 per 100,000 participants is actually lower than the 15.2 fatality rate of driving a passenger vehicle. Skiing – High-profile skiing accidents can make the sport seem very dangerous, but the National Ski Area Association figures regarding the fatality rate actually quote a .78 per 1 million skier/snowboarder visits. Skateboarding – Hurtling through half-pipes looks dangerous, which is why so many people feel that skateboarding is a high-risk activity. The United States Consumer Product Safety Commission has actually determined that the number of skateboarding injuries hovers around 8.9 per 1,000 participants. Basketball, a sport largely regarded as a safe sport, carries a 21.2 ER-treated injury per 1,000 players’ rate. Statistically, skateboarding is far safer than a game of basketball. Owning a Pit Bull – Few dog breeds are treated with as much fear and regarded with as much contempt as the American Pit Bull. Dramatic spikes in fighting activity and irresponsible breeding for aggression has contributed to the image of viciousness, but you’re statistically more likely to drown in a five-gallon water bucket, die as a result of a falling coconut or drown in your bathtub than be killed by a Pit Bull, according to DontBullyMyBreed.org. Skydiving – The United States Parachuting Association’s fatality rate figures show that approximately one in 100,000 jumps results in an accident. According to their research, a person would have to skydive 17 times in one year to bring their statistical risk of dying as a result of their hobby to the same level as their risk of dying in a car accident. Traveling in Mexico – Border wars, drug cartels and infamous drinking water are all things that come to mind when most Americans consider a visit to Mexico. While the FBI estimates that 15,241 people were murdered in the United States in 2009, only 111 of the estimated 8 million visitors who happen to be American citizens were killed in Mexico that year. Taking Birth Control Pills – Risk of blood clots, stroke and other health complications as a result of using hormonal birth control are well-publicized, the National Research Center for Women and Families asserts that oral contraceptive use is actually safer than pregnancy and childbirth for most women. Going on a Cruise – With the tragedy of the Costa Concordia event and the scandal regarding the Carnival Triumph, taking a cruise may not seem like such a relaxing vacation after all. According to ABC News 20/20’s cruise report, however, taking a cruise is eight times safer than crossing the street in New York City. Giving Birth at Home – A large 2011 study out of the United Kingdom published by the National Perinatal Epidemiology Unit showed that home births and midwife-attended births seemed to be as safe or safer for both mother and child than obstetrician-attended births. Shopping Online – According to the Better Business Bureau, online shopping can be just as safe as buying from brick-and-mortar stores or mail-order retailers, despite alarming reports about identity theft. Anesthesia – There’s something scary about going under the knife, especially when you know you’re going to be anesthetized. AnesthesiaWeb.org places the risk of dying as a result of general anesthesia alone at .01% to .0016%, though.